The voice is deep and thoughtful. He speaks slowly and deliberately, with hardly a trace of a Southern accent. 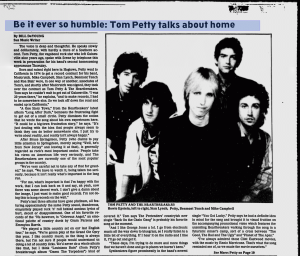 Tom Petty, the vagabond rock star who left Gainesville nine years ago, spoke with Scene by telephone this week in preparation for his band's second homecoming appearance Thursday. Born and raised right here in Hogtown, Petty went to California in 1974 to get a record contract for his band, Mudcrutch. Mike Campbell, Stan Lynch, Benmont Tench, and Ron Blair were, in one way or another, associates of Tom's, and shortly after Mudcrutch was signed, they took over the contact as Tom Petty & The Heartbreakers. Tom says he couldn't wait to get out of Gainesville. "I was 20 years there," he explains, "and to make records, I had to be somewhere else. So we took off down the road and ended up in California." "A One Story Town," from the Heartbreakers' latest album "Long After Dark," bemoans the frustrating fight to get out of a small circle. 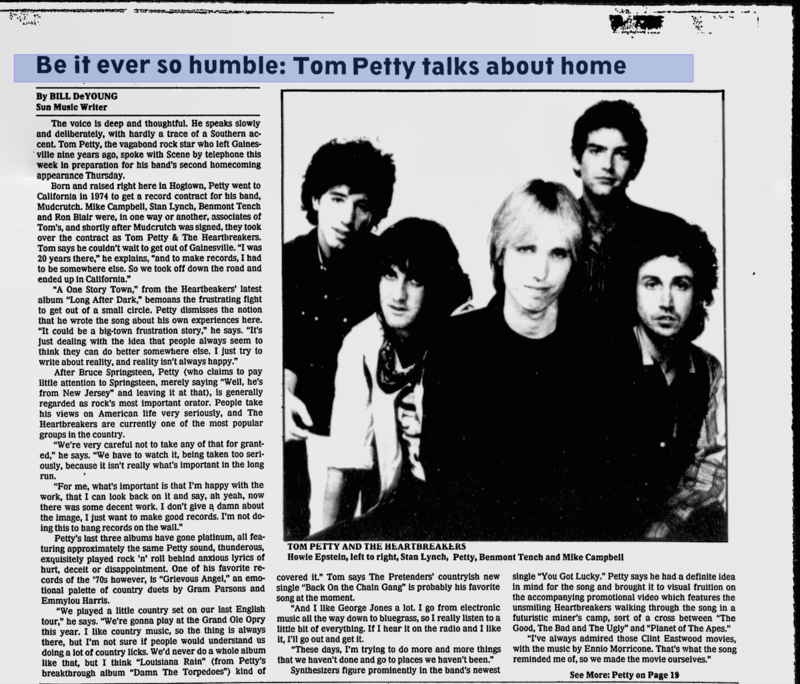 Petty dismisses the notion that he wrote the song about his own experiences here. "It could be a big-town frustration story," he says. "It's just dealing with the idea that people always seem to think they can do better somewhere else. I just try to write about reality, and reality isn't always happy." After Bruce Springsteen, Petty (who claims to pay little attention to Springsteen, merely saying "Well he's from New Jersey" and leaving it at that), is generally regarded as rock's most important orator. People take his views on American life very seriously, and The Heartbreakers are currently one of the most popular groups in the country. "We're very careful not to take any of that for granted," he says. "We have to watch it, being taken too seriously, because it isn't really what's important in the long run. "For me, what's important is that I'm happy with the work, that I can look back on it and say, ah yeah, now there was some decent work. I don't give a damn about the image, I just want to make good records. I'm not doing this to hang records on the wall." Petty's last three albums have gone platinum, all featuring approximately the same Petty sound, thunderous, exquisitely played rock 'n' roll behind anxious lyrics of hurt, deceit or disappointment. One of his favorite records of the '70s, however, is "Grievous Angel," an emotional palette of country duets by Gram Parsons and Emmylou Harris. "We played a little country set on our last English tour," he says. "We're gonna play at the Grand Ole Opry this year. I like country music, so the thing is always there, but I'm not sure of people would understand us doing a lot of country licks. We'd never do a whole album like that, but I think "Louisiana Rain" (from Petty's breakthrough album "Damn the Torpedoes") kind of covered it." Tom says The Pretenders' countryish new single "Back On the Chain Gang" is probably his favorite song at the moment. "And I like George Jones a lot. I go from electronic music all the way down to bluegrass, so I really listen to a little bit of everything. If I hear it on the radio and I like it, I'll go out and get it. "These days, I'm trying to do more and more things that we haven't done and go to places we haven't been." Synthesizers figure prominently in the band's newest single "You Got Lucky." Petty says he had a definite idea in mind for the song and brought it to visual fruition on the accompanying promotional video which features the unsmiling Heartbreakers walking through the song in a futuristic miner's camp, sort of a cross between "The Good, The Bad and The Ugly" and "Planet of The Apes." "I've always admired those Clint Eastwood movies, with the music by Ennio Morricone. That's what the song reminded me of, so we made the movie ourselves." Also in the works, Tom says, is a film for cable television called "Heartbreakers Beach Party." He says it will explain a lot, including the story of a much publicized fight to keep record prices down. "For a couple of years, it seems like that was all I talked about," he laughs. "Thankfully, I don't think about it too much anymore. There's some stuff in 'Beach Party' that addresses itself to that." The album "Damn the Torpedoes," escalated the Heartbreakers to superstardom, due largely to "Refugee," an exhilarating song of freedom, that, almost singlehandedly, put rock 'n' roll on the charts again in the discofied late '70s. 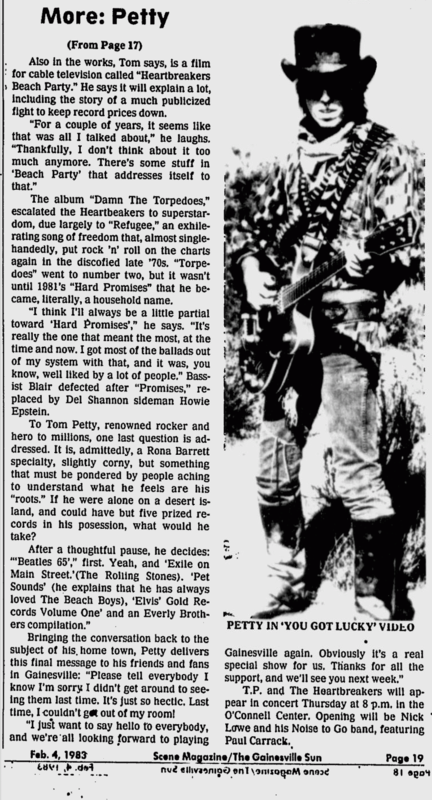 "Torpedoes" went to number two, but it wasn't until 1981's "Hard Promises" that he became, literally, a household name. "I think I'll always be a little partial towards 'Hard Promises,'" he says. "It's really the one that meant the most, at the time and now. I got most of the ballads out of my system with that, and it was, you know, well liked by a lot of people." Bassist Blair defected after "Promises," replaced by Del Shannon sideman Howie Epstein. To Tom Petty, renowned rocker and hero to millions, one last question is addressed. It is, admittedly, a Rona Barret specialty, slightly corny, but something that much be pondered by people aching to understand what he feels are his "roots." If he were alone on a desert island, and could have but five prized records in his possession, what would he take? After a thoughtful pause, he decides: "'Beatles 65', first. Yeah and 'Exile on Main Street' (The Rolling Stones). 'Pet Sounds' (he explains that he has loved The Beach Boys), 'Elvis' Gold Records Volume One' and an Everly Brothers compilation." Bringing the conversation back to the subject of his home town, Petty delivers this final message to his friends and fans in Gainesville: "Please tell everyone I know I'm sorry I didn't get around to seeing them last time. It's just so hectic. Last time, I couldn't get out of my room! I just want to say hello to everybody, and we're all looking forward to playing Gainesville again. Obviously it's a real special show for us. Thanks for all the support, and we'll see you next week." T.P. and The Heartbreakers will appear in concert Thursday at 8 p.m. in the O'Connell Center. Opening will be Nick Lowe and his Noise to Go band, featuring Paul Carrack.